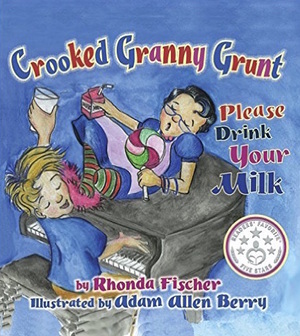 This fun-loving musical, rhyming story is about Crooked Granny Grunt, who does not drink milk. Oliver, her grandson, tries every antic to get her to take a sip and when she does, watch her do an amazing flip! The illustrations are watercolor art by Adam Allen Berry. He depicted the story beautifully with watercolor hand-drawn art. They are vivid colors and complement the story perfectly. Reading this book you will never forget Crooked Granny Grunt, and you won't forget to drink your milk. This book is based on a true story, and will delight children and adults alike. Crooked Granny Grunt brilliantly wins the 5 star award with Readers' Favorite and is a finalist for the Gold Medal.